If you have time for one day trip while in Udaipur, the UNESCO-listed Kumbhalgarh Fort should top your list. 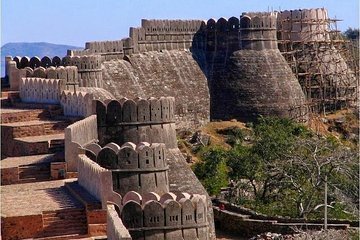 This massive, medieval hilltop fortress is one of Rajasthan’s most important historical sites, and boasts the world’s second-longest walls — after China’s Great Wall — making it a must-see. Your tour includes round-trip private transport, a 2-hour guided tour around the fort’s palaces, walls, temples, and terraces, and time for lunch (own expense). Start with pickup from your Udaipur hotel, and relax as you journey north through Rajasthan’s countryside to UNESCO-listed Kumbhalgarh, set in the Aravali Hills. After roughly 2.5 hours, drink in your first views of the massive, hilltop fortress, built in the 15th century by Rana Kumbh. Marvel at the huge walls snaking over the surrounding hills, and learn how they are wide enough for six horses, and extend for 22 miles (36 kilometers), making them second only to China’s Great Wall for length. After admiring the fort from below, drive to the massive main gateway and head inside with your guide. Then, spend two hours exploring the inner palaces, temples, courtyards, statues, and paintings. As you explore, learn about the fort’s history, including how its walls kept it impregnable for centuries. Plus, look around the showpiece: the Palace of Clouds (Badal Mahal). Situated at the fort’s highest point, the palace is the reputed birthplace of legendary warrior Maharana Pratap, and its jewel-bright rooms and terraces command spectacular, 260-degree views over Rajasthan’s hills. After your visit, refuel with lunch (own expense) at a local restaurant, and then ride back to Udaipur, where your trip ends with a hotel drop-off.